One of the priorities highlighted in our initial consultation was better public transport links. The Campaign for Better Transport has published a report (5th Feb, 2019), calling for a £4.8 billion ‘reopenings programme’ on the railways, to add 343 miles to the passenger rail network, made up of 33 new lines and 72 new stations. “The Case for Expanding the Rail Network” features one line in Hampshire (converting a ‘freight only’ line between Totton-Hythe-Fawley) which would relieve pressure on congested roads, support objectives on air quality, offer services to Southampton – and bring over 10,000 people within reach of a new train station. 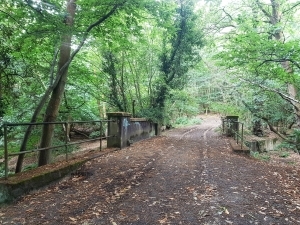 Remnants of disused railway line on the common between Blackwater and Minley. A similar ‘freight-only’ reopening/conversion between Oxford and Cowley would improve access to Oxford Science Park, serve 2 wards in the lowest 10%, and a further 2 wards in the next lowest 10% of Indices of Multiple Deprivation, this proposal brings 24,600 within 1km of a new train station. After Gosport and Waterlooville, Yateley is the largest town in Hampshire without access to its own railway station. This lack of access is compounded by no direct public transport links from Yateley to mainline railway South Western Railway services to London Waterloo from either Fleet or Farnborough. Smaller towns in the Hart District, like Hook and Winchfield have their own station. 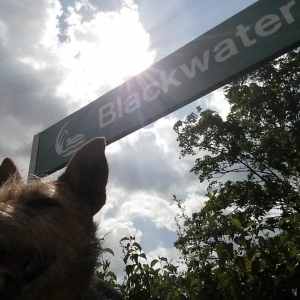 A border terrier ‘cross’ at Blackwater station. The last bus back from Camberley and Blackwater (which, with changes, serve Waterloo) leaves around 9.00pm, which further restricts public transport options from those other lines. When we started ‘unpacking’ what a vision for improving ‘Getting Around’ Yateley, Darby Green and Frogmore might mean (and how that connects with the wider local area), a number of those we have spoken to (and some of those on the team) have said we could do a lot worse than look towards places that have local public transport systems which are highly inter-connected, and make use of light-rail, trams or guided buses for longer term inspiration. Little did we know that, well before we embarked on this process, much work had already been done on such proposals for our very own area many years ago – but that they had fallen by the wayside. The “Blackwater Valley”. Source:Hart Functional Economic Area Analysis (August 2014). With its own credit to Enterprise M3, Commercial Property Market Study, April 2013. Back in 1991, Hampshire, Surrey, and the then Berkshire county councils, together with the then Network South East (British Rail) commissioned the ‘Blackwater Valley Rail Study’. It sought to increase use of the rail network in our area to relieve road congestion, improve access and connectivity, and develop new travel opportunities. It came up with a series of ideas, which centred on combining the two north-south routes through the area (the Reading-Guildford ‘North Downs’ Line which is ‘home’ to Blackwater’; and the Ascot-Aldershot Line which is ‘home’ to Camberley) at a new junction just north of Junction 4 of the M3, with a view to helping introduce an ‘Interchange’ station facility from both lines to the London-Southampton mainline at a new Farnborough station (replacing Farnborough North). tions’ at Christchurch Drive, and up on into the area where the Hampshire Lakes Retirement Village in Yateley. Since then, around the turn of the century, other studies have considered the need for better connectivity on public transport in our area – the Blackwater Valley Sub Regional Study (2003), the Thames Valley Multi-Modal Study (2003) – even a specific study (2002) looking at the introduction of a Blackwater Valley Mass Transit System (light rail or trams to you or me) which have envisaged a step-change in connectivity, incorporating light rail, guided bus and on-street tram options connecting Aldershot, Farnborough, Camberley and even Bracknell, with a major interchange at The Meadows – but proposals appear to get lost due to a lack of ambition, or overlapping authorities wanting to protect ‘their backyard’ against the backdrop of the identity of an emerging identity for a wider area called the ‘Blackwater Valley’. Stagecoach buses in the Blackwater Valley. We are already lucky enough to have a Quality Bus Partnership, providing an enhanced ‘Gold’ service on Route 1 through the area. It is no comfort to have discovered in our research that at one point, that route (which runs every ten minutes, earlier in the morning and later at night, with excellent quality vehicles) was, at one point in time planned to serve Yateley and Blackwater, rather than the Old Dean (more details, see here). That would certainly have helped with connectivity in our neighbourhood, but may also have helped complete that ‘corridor’ further up to the northern end of the Blackwater Valley, and its connection points. That was then. The release of this report (Feb 2019) is a reminder that these discussions are nothing new, but that with a lot more imagination within the strategic context of the ‘Blackwater Valley’ almost thirty years ago, at what would have been a much lower cost back then, we could have had a local network that would have been the envy of much of the rest of Europe – and Yateley might even have found a way of getting on the rail network! It could have been the focus needed ultimately for securing a light rail system which could have connected the places like Aldershot, Farnborough, Camberley, Fleet, Farnham, Blackwater, Sandhurst, Yateley and even Bracknell. ‘Blackwater Valley’ is bigger than Basingstoke, Barnsley, Blackburn, and Blackpool, for example, and regional centres like Milton Keynes, Norwich, and Oxford – but without a real coherent transport strategy, or a single, strategic centre. And the Guildford and Aldershot ‘Travel to Work’ area is the 20th largest in Great Britain, with a population of 653,090. Instead, infrastructure investment has been primarily roads based. A new major road (the A331 ‘Blackwater Valley Route’) was built north-south through the area (completed in 1996), and while that was necessary, that has soon filled up, as did the surrounding roads. Air quality along that corridor has suffered considerably. A bit more strategic thinking on the transport front, across the local authority borders involved, and looking at a reworking of existing rail routes, or incorporating light-rail could achieve so much more to support the vision of a thriving local economy centred on digital and design technologies, aerospace, defence, space, transport and mid-tech industries as articulated by the Enterprise M3 LEP which covers the area, and which TAG Farnborough Airport typifies. 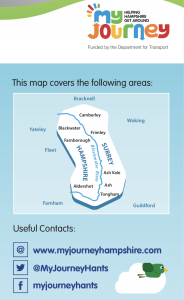 The process for compiling a neighbourhood plan for Yateley, Darby Green and Frogmore started with a vision and set of objectives, from which an initial consultation was conducted. 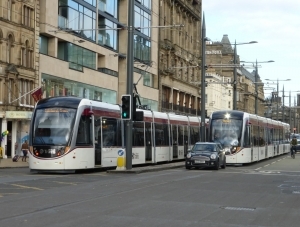 From that process, the ‘Getting Around’ sub-group has been charged with looking at opportunities for improving public and community transport; looking at improving cycle routes and provision for pedestrians; managing traffic flows and potential congestion more effectively; ensuring our roads and pavements are kept in good condition, and providing better parking for residents and businesses. Relevant priorities that were also highlighted in that survey were safe, well maintained and well-lit public spaces, and better transport links. Proposals such as those mentioned earlier dating from 1991 and 2002/2003 – the strategic context the ‘Blackwater Valley’ provided for promoting connectivity between our local towns, and the role both rail and light rail could play in this – are a valuable reminder that there are imaginative solutions out there for our own local area, similar to those in the Campaign for Better Transport report from earlier this month. A big ‘thank you’ to Councillor Adrian Collett for signposting us back to this nugget of a report from 1991, which have then prompted us to delve around and discover the rest of this picture. Instead, local commuters, whether to destinations within the area, or heading beyond have often felt they have little option but to jump straight into their car, however much they might want to use public transport – it’s all a bit ‘chicken and egg’. 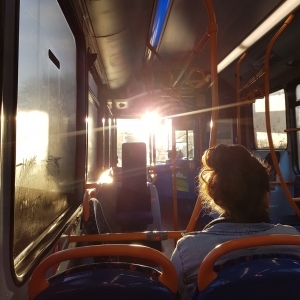 Some argue that the existing situation proves there is little demand for public transport, but that probably has more to do with the paucity of provision, and lack of connectivity around the area. 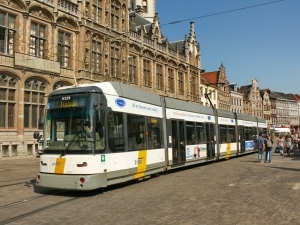 Since that initial consultation on our neighbourhood plan for Yateley, Darby Green and Frogmore, when we have asked people what we can learn most from things that already work well about ‘getting around’ in somewhere else they know, a number of people have suggested ‘light rail’ or even tram solutions – comparing with other places, like Ghent (Belgium), Tallinn (Estonia), Adelaide (Australia), Edinburgh and Nottingham. Such ideas, whilst not an immediate prospect for our neighbourhood plan, they are worth noting as possible aspirations within a ‘Blackwater Valley’ context, even if not specific policies within our own plan, with a view to improving connectivity, and above all, reducing congestion. We continue with our deliberations – most of which are specific to our neighbourhood – but the publication of this Campaign for Better Transport report just seemed the ideal backdrop to reflect on aspirations for better public transport connectivity, and for our strategic transport planning to have more of a Blackwater Valley backdrop in the future.